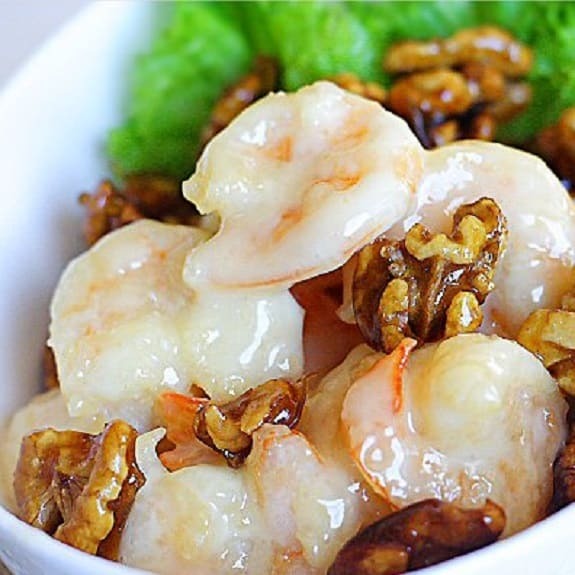 Honey walnut shrimp salad recipe. Very easy, healthy, and delicious shrimp salad. Use it as a main or side dish. Learn here how to prepare the best healthy shrimp salad. Do you want to prepare an easy vegetable salad? Here are instructions on how to make it, enjoy! In a mixing bowl,combine shrimp and egg white. Mix well and set aside. In a small saucepan,boil 1/2 cup water. Add sugar and stir gently until it turns thick and golden color. Stir in walnut halves and boil for 2 minutes. Drain boiled walnuts and place on a parchment paper to dry. In a large nonstick skillet,heat cooking oil over medium-high heat. Dip shrimp in cornstarch and fry in preheated oil until golden brown. Remove fried shrimp from the skillet and drain on paper towel. In a small mixing bowl,combine together mayonnaise,lemon juice,honey and condensed milk. Mix well and set aside. Add fried shrimp to honey mixture and toss well. Transfer to serving platter and garnish with candied walnuts. Serve honey walnut shrimp immediately.